While we don’t celebrate Christmas the same way as a lot of other people we do have four-ish Christmas traditions. The first is home-made sushi on Christmas Eve. This year I worked until quite late on Christmas Eve as I was trying to finish the rewrites on two articles – and yay I got them done so that is one less thing to worry about at 3am from know on. This did mean that the sushi was a rather hurried affair though – and there aren’t many photos – sorry. 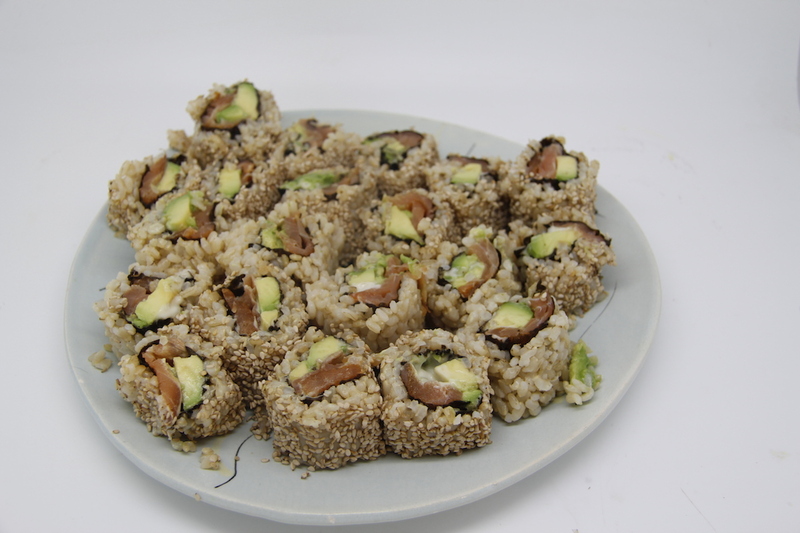 This year I used brown sushi rice which taste good but doesn’t stick together the same way as white rice does. And I also used some home-smoked salmon as I was curious what it would be like. I added mayonnaise as well, but don’t tell anyone. Some have sesame seeds round the edge and some don’t – I like them with sesame seeds and James doesn’t. I also made inside out rolls as James prefers these and I am lovely. We had it with a carrot salad made with the leftover dressing from the kohlrabi and cabbage salad from a few days ago. 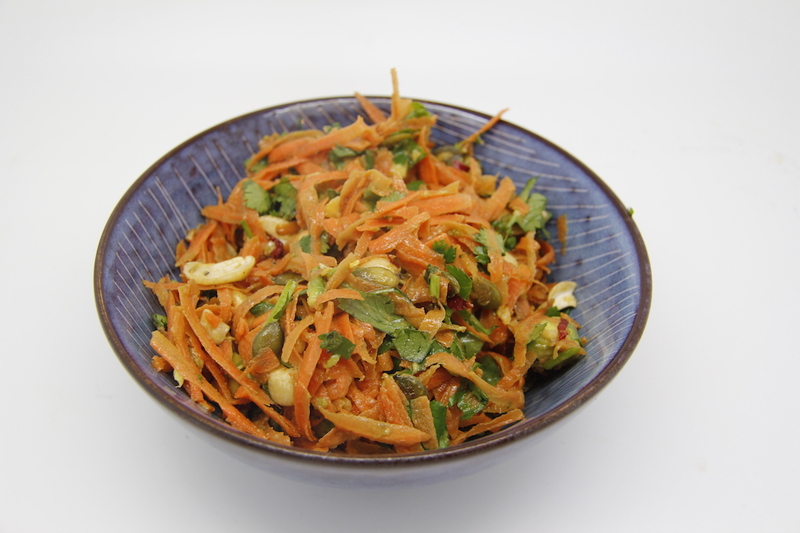 Basically it is grated carrot, bit of avocado leftover from the sushi, toasted cashew nuts, coriander and the dressing – easy. 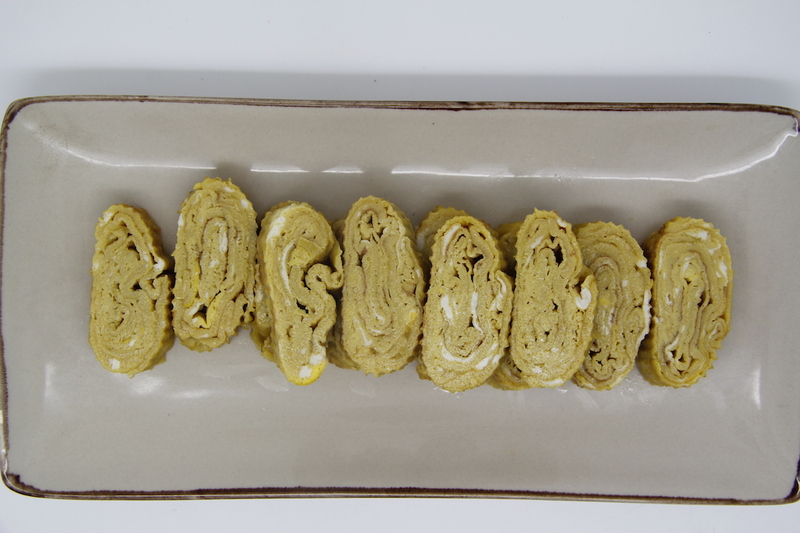 And Japanese rolled egg omelette. 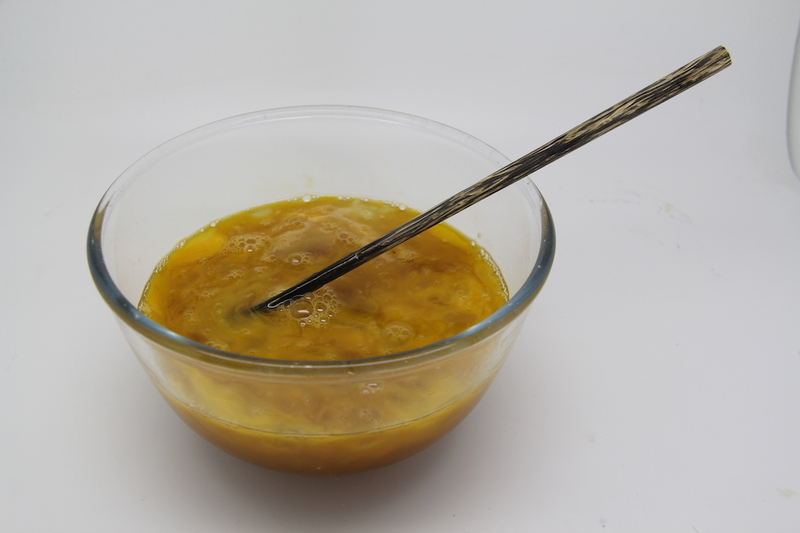 We currently have a lot of eggs and this is an easy way to use up 8 – it is also delicious. 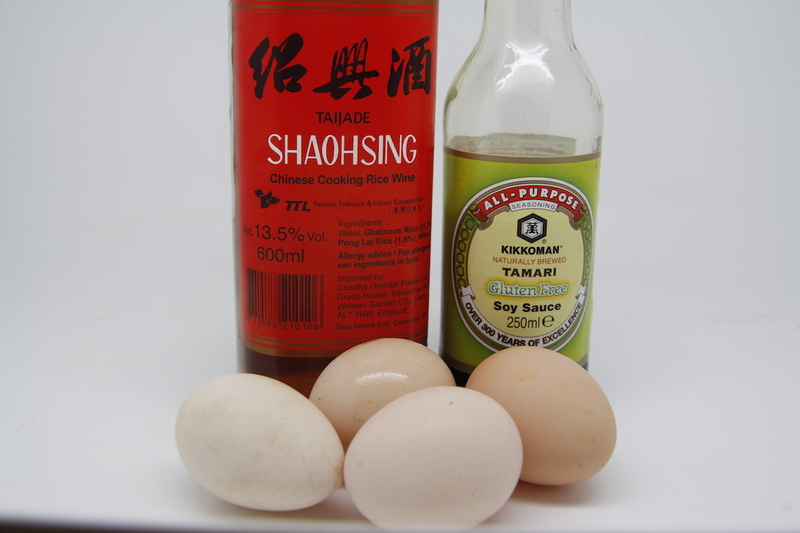 8 eggs; 3tbs sugar; 4tsp soy sauce; 6 tbs sake or rice wine; vegetable oil. Mix the eggs. 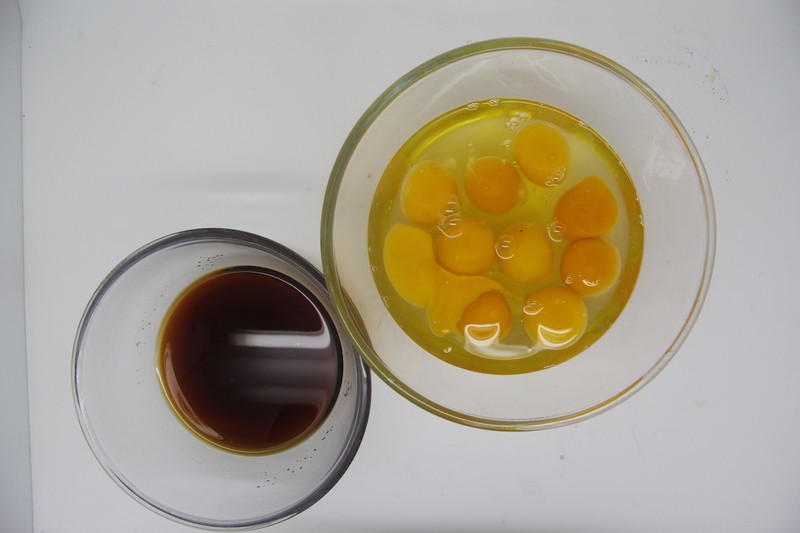 Dissolve the sugar in the soy sauce and sake and then mix into the egg. This amount makes two rolled omelettes so you can pour the mixture into two separate bowls – I am assuming you will do this, but of course you can do what you want to. Heat up a frying pan with some oil in it. Pour 1/3 of the mix into the pan – it should make a very very thin omelette. Let it cook, then gradually roll it up and leave it at the back edge of the pan. Add another 1/3 of the mix – make sure some goes under the rolled up omelette. Wait until it is cooked and then roll the existing rolled omelette over this one – you should just have the one rolled omelette now. Do the same with the last 1/3 of the mix. 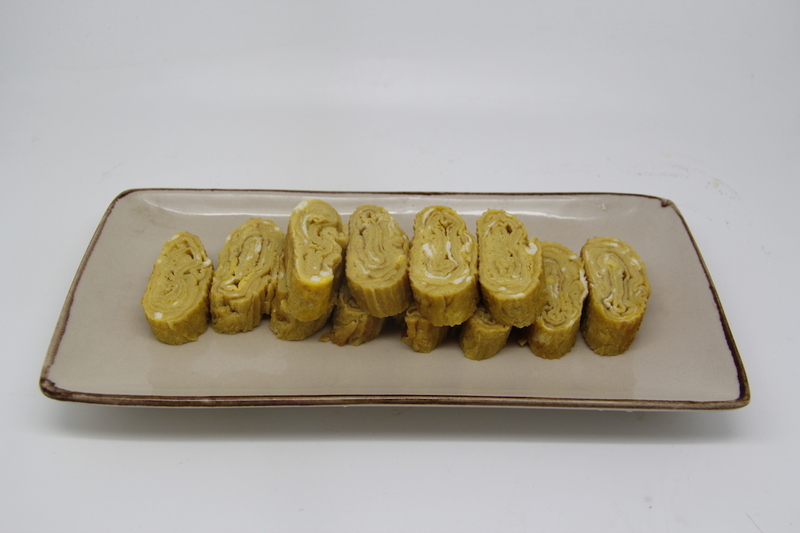 Roll it up and then slide the rolled omelette onto a bamboo mat and roll the mat tightly so the omelette keeps its rectangular shape. Yes, this would be easier to understand if I had taken photos but I was hungry. Leave to cool in the fridge. Do the same with the second batch of egg. When you are ready to serve slice the omelette and eat with soy sauce, ginger or whatever. N.B. and for the other traditions well you will just have to wait until tomorrow ….. Taking a week off as we have friends coming and projects to do – then it is full speed ahead with marking, a new MA module to finalise and three books to finish – eek – the edited volume is the first that needs to be sorted. So glad you liked the turkey and even more glad that you are using every last bit – that is so wonderful. Will check out the show – sounds good. Hope you all had a good Christmas. We built a duck pond …. Off course you built a duck pond over the holidays, I expected nothing less 😉 You’re both quackers of course, but then again, duck – nom nom nom – that’s next years Christmas dinner sorted please. Much as I loved the turkey, I’m with you on the taste of duck!! Oh no, I gave the secret away – eeek. And omg we watched the show – these wicked wicked llamas – strangely they looked just like Juniper, Peanut and Inky Dinky Do … I am getting worried …..